So my soon-to-be-released book, Amazing Feats of Civil Engineering, features three major projects: the Panama Canal, the Burj Dubai, and Confederation Bridge, an 11-km span linking New Brunswick and PEI over the Northumberland Strait. I first visited PEI in the mid-1990s, before the Bridge was built. 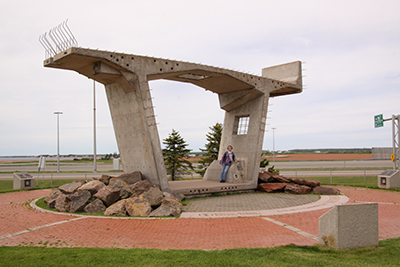 Last month, Tech Support had a conference in Charlottetown, and I tagged along, excited to drive over the concrete structure I’d spent weeks researching for the book. I was also excited to visit the bridge museum in Borden-Carleton, the town where most of the Bridge’s concrete components were manufactured before being assembled in the Strait. When we arrived at Gateway Village, we explored the beach, the Cows Ice Cream store, and various souvenir shops, giving Tech Support the opportunity to try on a lobster hat (alas, I am not allowed to post the photo). We couldn’t, however, find the museum. I finally broke down and asked the staff at the visitor centre, who informed me that, in fact, there had been a museum. But it closed four years ago. Before I even moved to the Maritimes. Le Sigh. What about you? What museums, tourist attractions, or other events have you been just a little too late for?